Looking for the very best hostels in Krakow? There are quite a few to pick from but we’ve chosen what we think are the cream of the crop of Krakow hostels. Poland is known for its vibrant and cheap nightlife and Krakow is no exception. 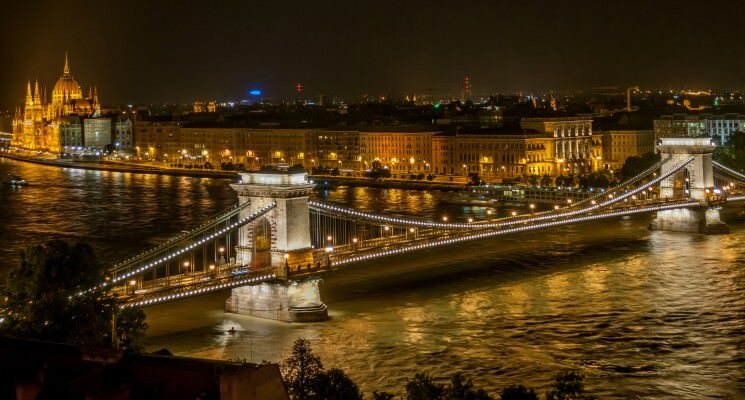 Despite being the second largest city, it is visited by far more tourists than the capital Warsaw. 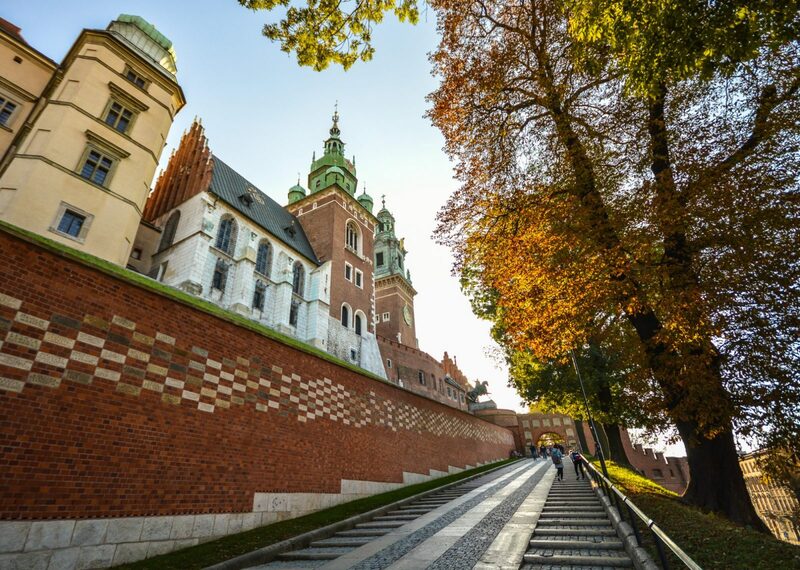 A wonderfully preserved historical center, amazing culture, and its proximity to the infamous Nazi concentration camp Auschwitz are just some of the reasons why Krakow is so popular. Travelers have plenty of budget accommodation to choose from in Krakow. If you are not looking for grand luxury, staying in a hostel in Krakow is a great way to save some money for other things while you travel. The best hostels in Krakow have more to offer than just cheap dorm beds. The right hostel should feel like a cozy, secure, and comfortable little home away from home. The best hostels in Krakow should also offer its guests plenty of ways to meet other travelers, have a nice atmosphere, pleasant and friendly staff. All of this is super important if you want to be social while traveling, of course. A great hostel is also clean, tidy, organized, run professionally, and mindful of the needs of it guests. Huge bonus if it has a nice kitchen to cook meals in which will save you tons on your budget. You should keep all of that in mind when picking a Krakow hostel for your visit. 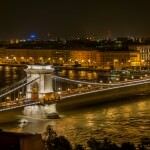 With all of this in mind we put together a list of what we think are the best hostels in Krakow. So come and see for yourself all the wonderful things this city has to offer! Greg and Tom Beer House Hostel is exactly what one would call a party hostel, and they are proud of it. The hostel is located on Florianska Street, a party street in the heart of Krakow. 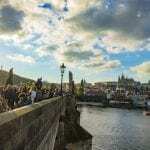 If that’s not enough, the hostel offers events every day to socialize and get ready for the nightly pub crawls. Their fantastic free breakfasts and dinners (even for vegetarians and vegans!) make it one of the best hostels in Krakow. Apart from the organized events, the communal dorm rooms are a great place to bring people together. The rooms in this Krakow hostel are new and clean and have everything you need, like private safe box, power plugs, a reading light, and a comfy mattress. They even have a delightful view of Old Town. Greg and Tom Beer House Hostel is the place to be for those willing to meet fellow travelers and have great fun without sleeping much. There is just one rule, only guests between 18 and 40 years old are allowed! We don’t love this age restriction, to be honest, but it does ensure a “party all the time” vibe. The hostel also has two sister properties in town, Greg and Tom Hostel and Greg and Tom Party Hostel. Both with the same social party atmosphere. So if you are looking for a Krakow hostel catering towards the party scene this is a good place to start. Want more info? 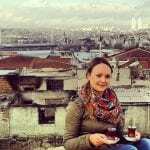 Check out HostelWorld or Booking.com for reviews, details, or for the best rates to book your stay! Want another ultimate party hostel in Krakow option? Try the Pink Panther hostel which is a few steps away from the Market Square! In comparison with Greg and Tom Beer House Hostel, Pink Panther is for budget travelers who like to combine partying with sightseeing. 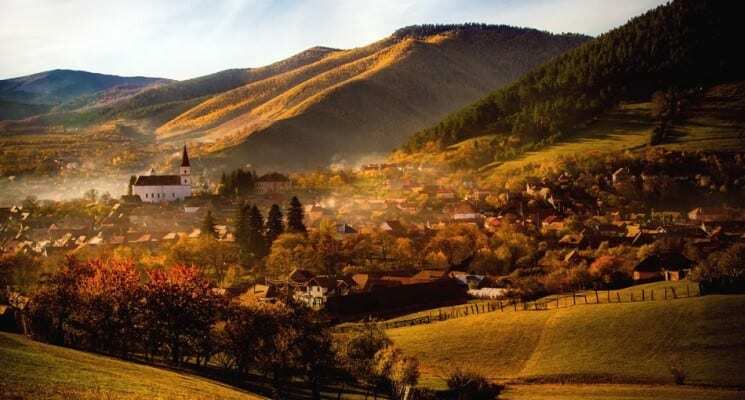 Chocolate Fountain Fondue night on Monday, Beer Pong on Tuesday, or Žurek – Traditional Polish Sour Soup on Wednesday acts as a warm up for the Royal Pub Crawl! Their nightly activities and free city tour organized by the amazing staff make it one of the best hostels in Krakow. Guests of this Krakow hostel can choose from a wide range of rooms – from twin to twelve bed dorms, all equipped with personal lockers and power plugs by the bed. After a wild night, guests can enjoy a free breakfast and free coffee and tea throughout the day. Unlike Greg and Tom Beer House Hostel, Pink Panther doesn’t have age limitations, so everyone is welcome! 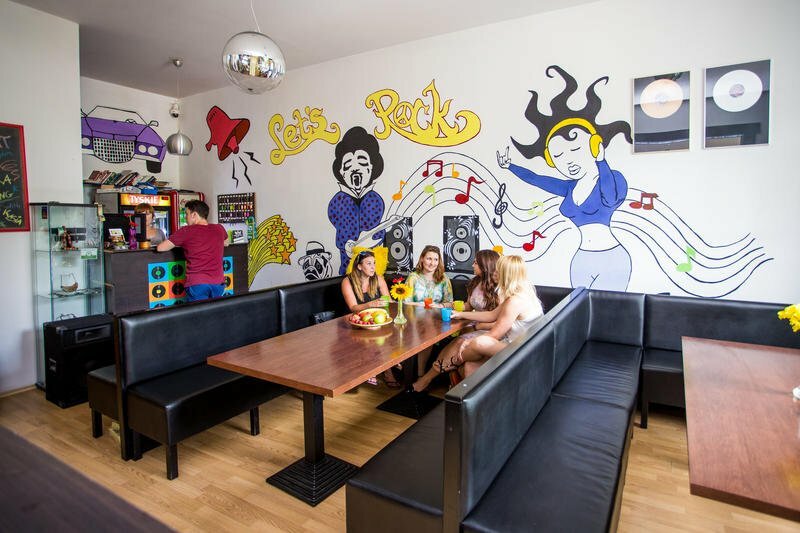 The owners of Pink Panther Hostel have another property in Krakow – Let’s Rock Hostel. The similarity can be seen in the organized daily events or free walking tour, but this hostel has more of a street art design than the other one. 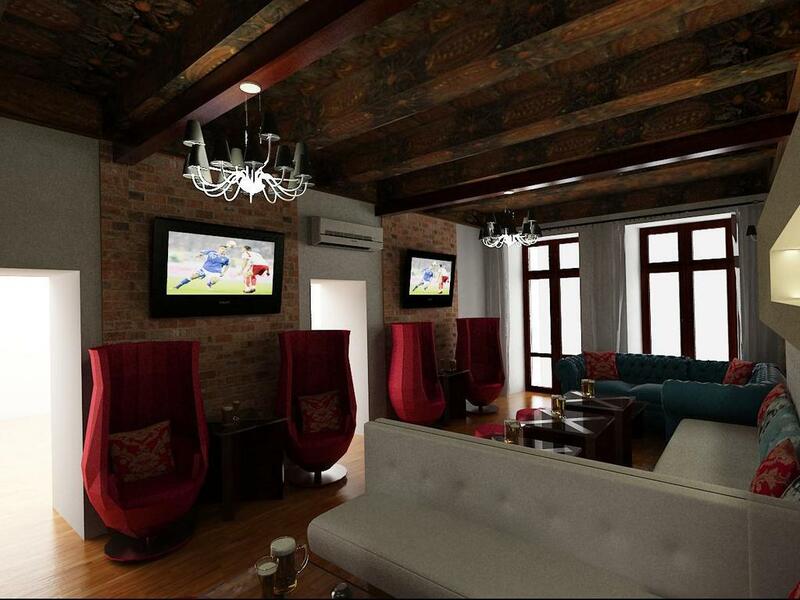 It is not exactly an insane party hostel, more of a chill vibe for people to socialize in the common room. If you are looking for a Krakow hostel to relax in during the evening you’re better off booking here. 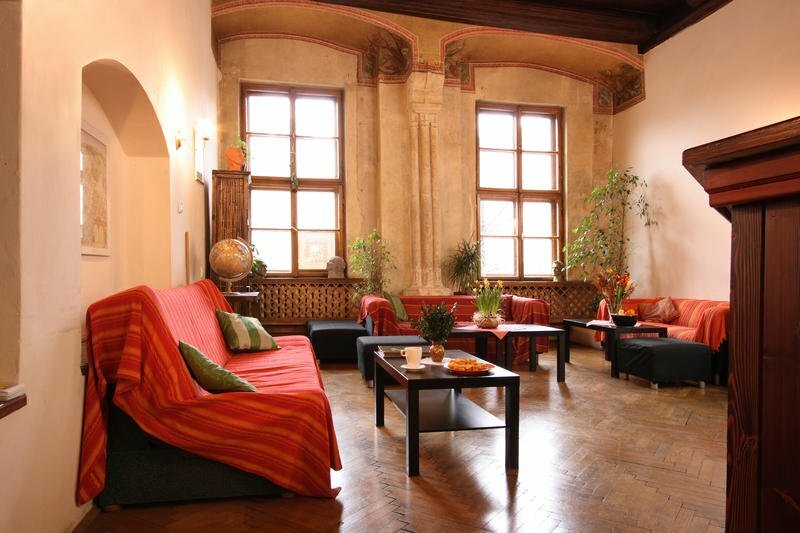 Guests of this Krakow hostel can choose between dorms and private rooms. Free breakfast is provided every morning and you can enjoy free tea or coffee throughout the day. All that makes Let’s Rock (a bit ironically) one of the best hostels in Krakow for the slightly more chill traveler. Krakow’s long and colorful history is written into every inch of the Cracow Hostel. Starting with its excellent location right on the main Market Square and continuing with the exceptional interior of its renovated fourteenth century house. The high wooden ceilings, pine stairway, and ancient columns create an unique atmosphere for guests. The hostel has everything a traveler can need, from power plugs by the bed and private lockers, to a perfectly equipped kitchen where they can cook their own meal. Not to mention the friendly multi-national staff and a breathtaking view over the Square from the top floor. Definitely an option for any backpacker or budget traveler looking for a calm and clean Krakow hostel. 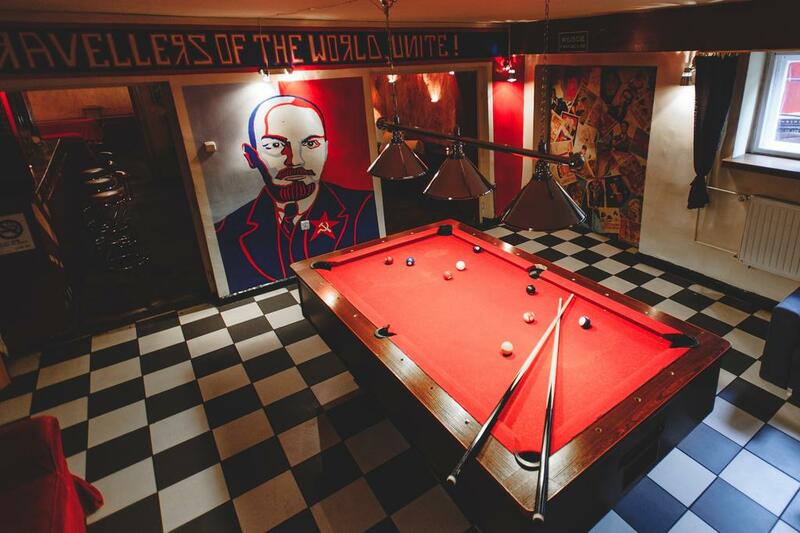 Let’s jump from the Middle Ages to the Communist Era with the Good Bye Lenin Hostel. Retro is IN these days so nobody should expect a modern hostel here. Instead, there are many small details to enjoy together with funny pictures of famous communist dictators and originally modified communist mottos on the walls. Impressively attentive staff at reception and friendly bartenders in their private bar (serving up beer glasses with Lenin’s face on them) makes it one of the most welcoming and best hostels in Krakow. The hostel is also super clean and the wifi is exceptionally strong. A basic breakfast is also provided free of charge. It does tend to get a little noisy in the rooms here, but if you are traveling with earplugs you’ll be just fine. A fine choice to a budget Krakow hostel. 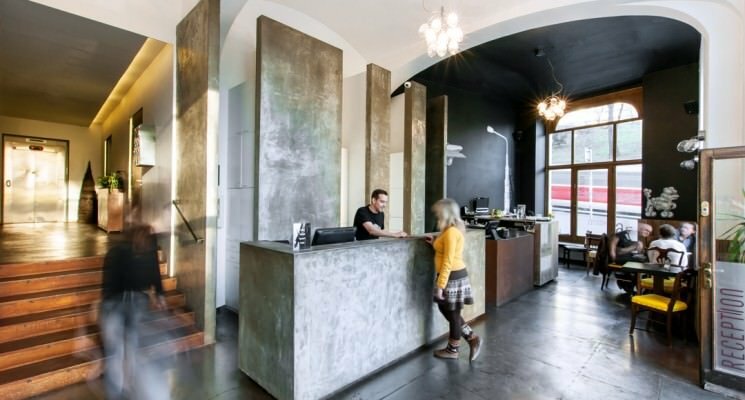 The hostel Luneta Warszawska is for all romantic and adventurous souls. 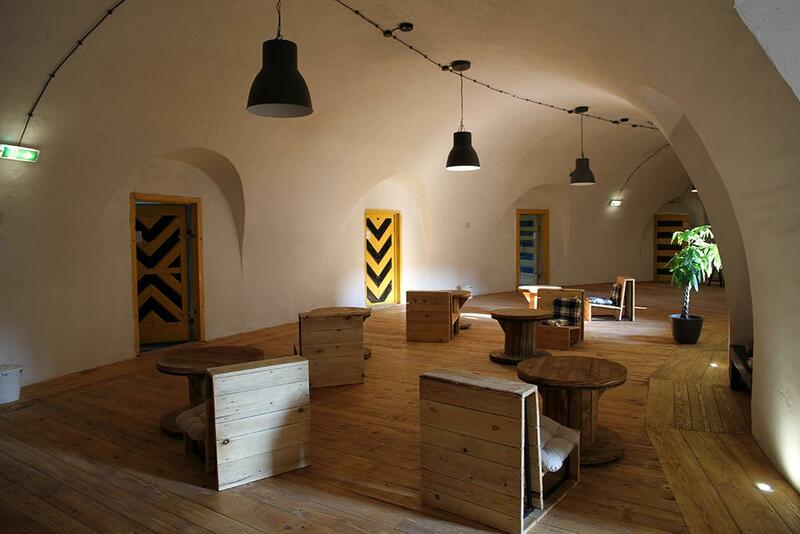 Situated in a huge nineteenth century fortress, the hostel is just 20 minutes from the Market Square. 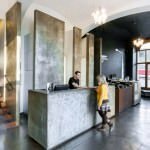 The entire building of this Krakow hostel has been newly refurbished and modernized, and has a unique character highlighted by modern artwork. 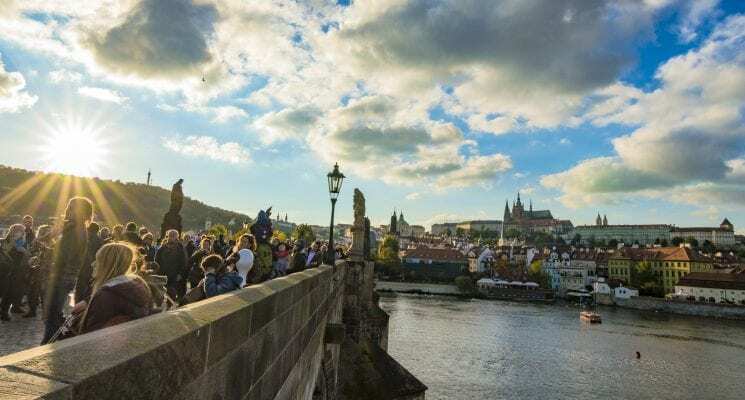 Guests have plenty of options to hang out in the hostel, including sitting by the fireplace in their dorm room, enjoying the 120 square meter common room, or lazing about in the huge outdoor sitting area with a view of the entire fortress grounds. All of the above makes Luneta Warszawska a cool hostel in Krakow, so anyone who isn’t keen on staying in a party hostel and doesn’t mind walking through a cemetery to get there, should try it! There you have it guys, our list of the best hostels in Krakow, Poland. 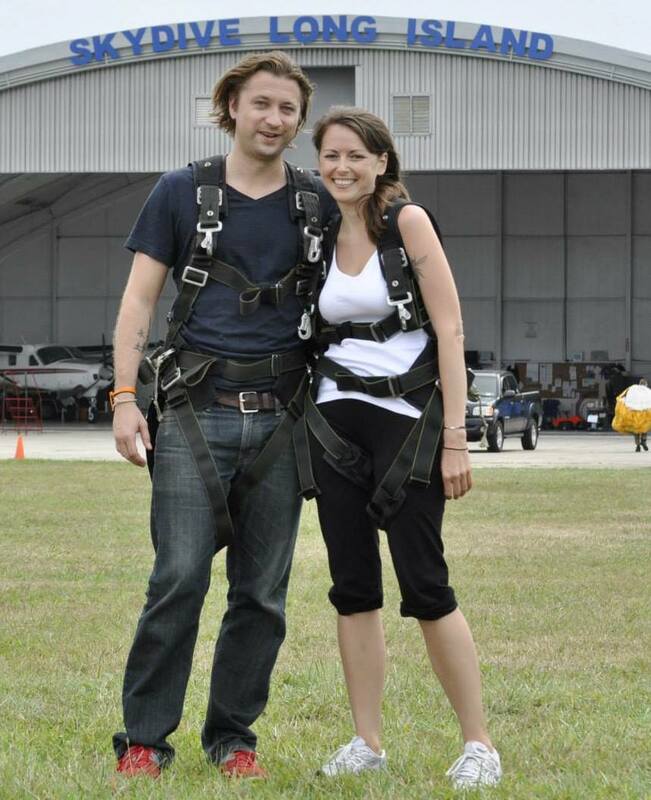 We hope you enjoy your visit to this historic city as much as we did! As always, happy travels, and we’ll see you on the road!